Maintaining a website can seem like a daunting task at times. What type of content do I need? What size should images be? How can I have images rotate in a carousel fashion? What’s the best way to feature events? I could really benefit from a sign up form on this page rather than a plain old email link. I don’t even know code, how can I add pages?! Where’s Steve the IT guy when I need him?!? But, with content management solutions, a company’s website maintenance becomes exponentially easier, stress-free, and cost-effective. Click to see a larger example. With content management solutions in place, a website administrator’s life is simplified and made easier, allowing a user of any technical background the calm and ease of updating any type of content on its company’s website. In this post and the series to follow, we’ll discuss the benefits and advantages of integrating websites with content management solutions as well as share some specific examples from our 14 plus years experience and expertise working with a range of CMS platforms, more specifically with the SilverStripe CMS platform. First, what are content management solutions (CMS)? Content management solutions allow organizations to easily, quickly and cost-effectively maintain content in its websites, social media and other online “properties” like intranets, mini-sites, and portals. Content management allows content writers, designers and marketing managers of any technical background to operate independently of your technical resources, reducing the cost of adding and updating site content which in turn lowers your overall marketing costs. This is made possible by special software – content management software – that is installed with your website and gives your staff easy to use interfaces to make changes to pretty much any aspect of a website. But, we have one person in-house who is our go-to developer…why would we need/how could we benefit from a content management solution? Control, control, control – No more relying on a one-person team to make any and all edits. Any staff member could now maintain his own section on a website. And, if you are worried about aggressive updates or mistakes, a CMS has built-in versioning to revert back to a previous, mistake-free version of the post or you could use a Workflow module to monitor posts from content authors and only publish when reviewed by upper management. 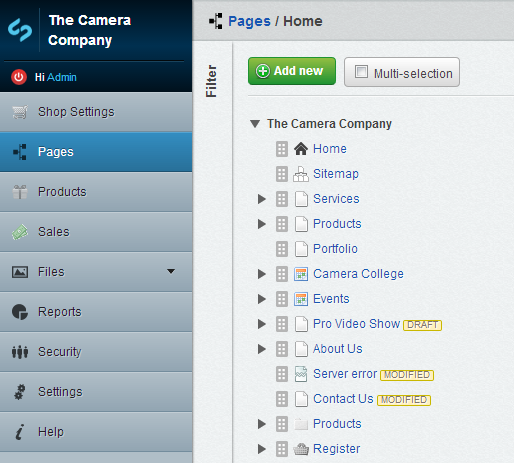 Organization – Managing content has never been simpler, with use of SilverStripe’s Drag-and-Drop reordering for pages. And, all content you want to edit is listed in the page tree when you first login — unlike WordPress, Drupal, and Joomla which may have different backend sections for different pages (blog posts, contact forms, photo galleries, etc). Search engine optimization – The SilverStripe content management solution comes with search engine friendly URLs, meaning you can have rich keywords in the URL. Further, it has reporting for any broken links within the site so admins can easily fix for better internal linking, a crucial component to any website looking to rank well in Google, Yahoo!, and Bing. Cost-effective – Over time, having one individual on staff or a firm to constantly make updates costs time and money. A CMS, while an investment, makes more sense (and cents) in the long-term. Well, everything sounds great…what can it all do? Does your website currently use a content management solution? How does it help you manage your website content? Let us know in the comments below or tell us about your content management challenges. And, if you are ever in need of integrating a website with an expert CMS integration company, contact our content management solutions experts.